12699 records – page 1 of 254. Photograph of the storage area at the Burnaby Village Museum. A taxidermic animal head is lying with its nose facing the ceiling on one of the tables. Beside that is another table, covered with plastic. 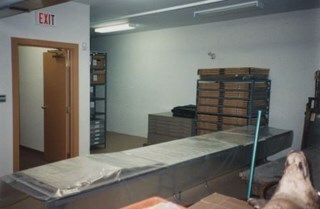 Storage shelves are lined up against the walls on the left. Photograph of Burnaby Village Museum. Photograph of Heritage Village (now Burnaby Village Museum) at the time of its construction. The Ice Cream Parlour is visible on the left side. 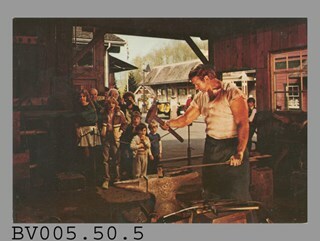 Inscription in pencil on verso of photograph reads: "1971 HERITAGE VILLAGE/ UNDER CONSTRUCTION/ ICE CREAM PARLOUR ON LEFT./ [Curator's note 1993]/ CMY", stamped, l.r. 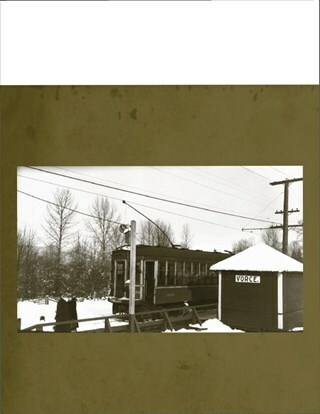 "5320"
File consists of correspondence pertaining to the Burnaby Village Museum. 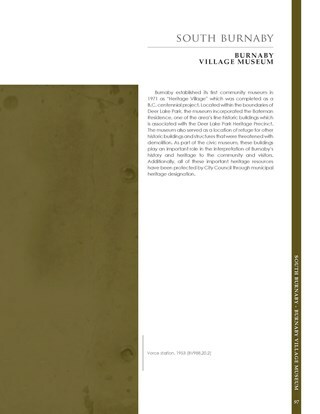 Also included in the file is a copy of "The Villager" newsletter (produced by the Burnaby Village Museum). File consists of papers pertaining to the Burnaby Village Museum including correspondence, annual reports and meeting minutes as well as project proposals (including the Central Area Transportation Planning Study produced by the Director of Planning and Building Inspection) and promotional materials. File consists of correspondence between Robert W. Prittie, former Mayor of Burnaby and the Burnaby Village Museum. Included in the file are pamphlets, newsletters and minutes from an annual general meeting. Also included is a felt flag promoting Burnaby and Heritage Village (former name). 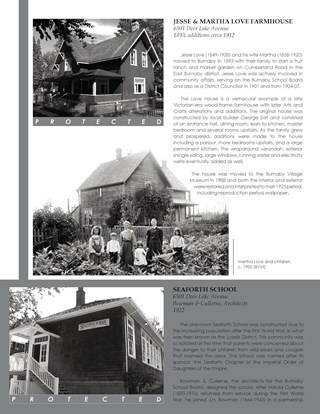 File contains a photocopied report on the restoration of interurban 1223 as well as a photocopied report of the Master Plan for the Burnaby Village Museum expansion. 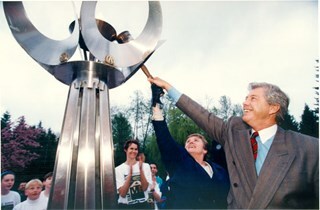 Photograph of Burnaby mayor Doug Drummond igniting the cairn at Burnaby Village Museum which began the countdown to the British Columbia Summer Games at Swangard stadium, joined by Canadian High jumper Debbie Brill (back). Note in black ink on recto of photograph reads: "75% Bby p. 1 / Bby 1003 Mario"
Photograph of Bernie Bellinger in the Burnaby Village Museum Drug Store. Photograph of Heritage Village (now Burnaby Village Museum) at the time of its construction. A pickup truck is partially visible on the left. Stamp on verso of photograph reads: "289 [illegible number]"
Collection consists of over 3000 historic photographs of Burnaby that were collected by or donated to the Burnaby Village Museum since its incorporation in 1971. 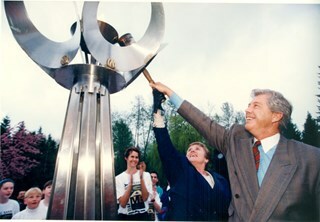 The Burnaby Village Museum was established in 1971 as a Heritage Village and the name was officially changed to Burnaby Village Museum in 1984. Originally governed by a society, the museum became part of the City’s Parks and Recreation Department in 1990. Museum operations became part of the Cultural Services Division of Parks and Recreation in 1995. The museum’s board consists of a nine-member Parks, Recreation & Culture Commission which consists of two City Council appointees and seven members at large, all appointed by City Council. Photograph of the church at the Burnaby Village Museum taken in 1974. 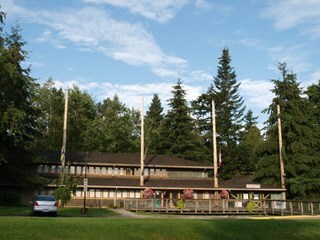 Caption on original matte read: "Interdenominational church, built in 1974, by the South Burnaby Men's Club, at the Century Park Museum (Burnaby Village Museum). The church is a replica of 'the turn of the century' building and was given to the museum in October, 1974. The church is used by many couples for their wedding ceremonies." File consists of papers pertaining to the Burnaby Village Museum Association (formerly the Century Park Museum Association) including financial records and meeting minutes. 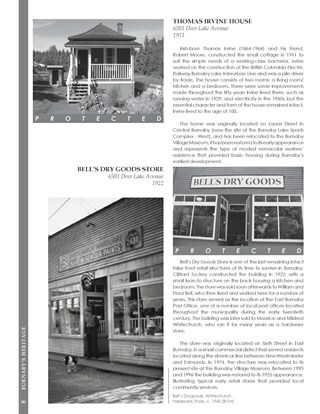 Also included in the file is a copy of "The Villager" newsletter (produced by the Burnaby Village Museum). File consists of papers pertaining to the Burnaby Village Museum Association (formerly the Century Park Museum Association) including a photocopy of the Regional Memorandum of Agreement with Union Representatives, committee reports and financial records. 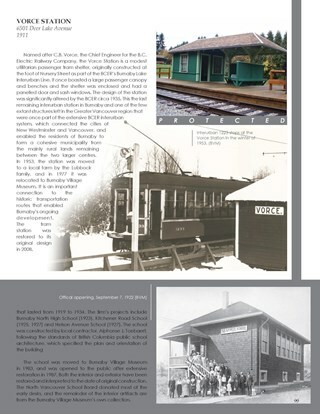 Also included in the file is a copy of "The Villager" newsletter (produced by the Burnaby Village Museum). File consists of papers pertaining to the Burnaby Village Museum Association (formerly the Century Park Museum Association) including meeting minutes, annual reports and correspondence (most of which pertains the proposed "Expansion Concept"). Also included in the file are the organization's constitution and agreement along with job and committee descriptions. 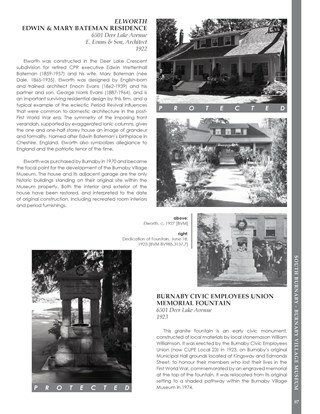 File consists of papers pertaining to the Burnaby Village Museum Association (formerly the Century Park Museum Association) including financial records, reports, newspaper clippings and promotional materials. File consists of papers pertaining to the Burnaby Village Museum Association (formerly the Century Park Museum Association) including meeting minutes, newspaper clippings, promotional materials, correspondence and project proposals. File consists of papers pertaining to the Burnaby Village Museum Association (formerly the Century Park Museum Association) including meeting minutes, newspaper clippings, correspondence and project proposals. Note in black ink on recto of photograph reads: "103% Bby 2 / Mario Bby 1003 B+W"
Photograph of a potato sack race at Burnaby Village Museum, as a part of Canada Day celebrations. 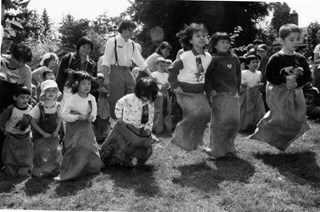 Note in black ink on recto of photograph reads: "1450 Bby John / Bby - 2 - 71%"
Accompanying caption reads: "July 5, 1998 1450: / Young Participants do their best to bounce their way to victory in the sack race, part of Canada Day celebrations at Burnaby Village Museum Wednesday." p. : ill. ; 22 cm. 2 copies held : copy 1. 2 copies held : copy 2. Photograph of Heritage Village (now Burnaby Village Museum) at the time of its construction. The Chinese Herbalist Shop is at the centre with the edges of the Bakery and the Print Shop visible on either sides. Stamp on verso of photograph reads: "5320"
Photograph of the site of the Blacksmith Shop at Heritage Village (now Burnaby Village Museum) when its foundation and uprights were first constructed. The road on the right was to become Katherine Street. Photograph of the site of the Blacksmith Shop at Heritage Village (now Burnaby Village Museum) when its foundation, roof and uprights were first constructed. Photograph of Heritage Village (now Burnaby Village Museum) at the time of its construction with the foundation for the building that now hosts the Royal Oak Garage, the Optometrist and Central Park Theatre in the foreground. Workmen are visible standing next to a pick-up truck in the background. Photograph of Heritage Village (now Burnaby Village Museum) at the time of its construction with the foundation, walls and roof of the Royal Oak Garage on the left side and the General Store in the center. Photograph of Royal Oak Garage at Heritage Village (now Burnaby Village Museum) at the time of its construction. Photograph of the General Store and Stride Studio at Heritage Village (now Burnaby Village Museum) at the beginning stages of construction. Photograph of the Drug Store at Heritage Village (now Burnaby Village Museum) at the beginning stages of construction. 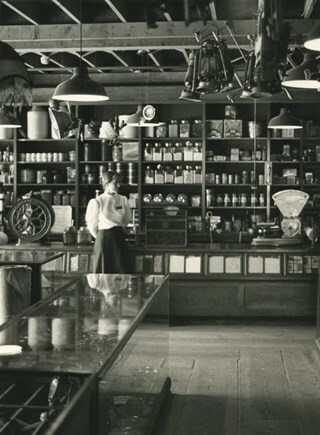 Photograph of the Drug Store at Heritage Village (now Burnaby Village Museum) during construction. Photograph of the Stride Studio at Heritage Village (now Burnaby Village Museum) during construction. A roof framer is visible hammering. Photograph of the Stride Studio at Heritage Village (now Burnaby Village Museum) during construction.